Contrasted alongside anemic crop commodity prices, cotton was once viewed as merely the best pig in the pen. No more. Significant profitability and growing demand are pushing white fiber across increasing acres. Since cotton acres scraped low in 2015, the Cotton Belt’s white blanket has expanded by 4 million acres, and 2018 appears to continue the march. Growers are expected to increase cotton ground by 7% in 2018 to approximately 13.5 million acres—the highest total since 2011. USDA’s final 2017 estimate pegged yield at an unprecedented 905 lb. per acre. “USDA’s initial projections for the 2017 crop suggested that the farm-level upland cotton marketing year average price could fall between $0.54-$0.74 per pound, and the USDA’s current expectations suggest it is likely to be at the upper end of that range,” according to The Feed, Farmer Mac’s quarterly report on agriculture. 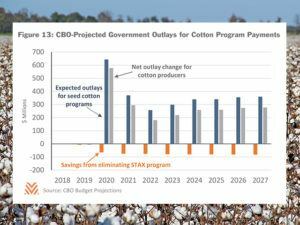 Cotton producers were also bolstered by the Bipartisan Budget Act of 2018 (BBA), which dropped the Stacked Income Protection Plan (STAX) program and re-established cottonseed access to ARC and PLC payments (beginning in 2018). “Producers with generic base acres will be able to reassign acreage to seed cotton, and will be eligible for PLC payments if their effective seed cotton price falls below the program’s $0.367 reference price,” Farmer Mac details. Across 2018-2027, the change may result in $3.2 billion in available program payments. Increasing demand may fuel the cotton industry’s 2018-2019 marketing year. Global cotton consumption consistently runs parallel with global GDP growth, which looks to be gaining steam. Despite the positive world outlook, several challenges could hinder cotton prices. China’s stocks-to-use ratio is still high, and cotton’s grip in the fiber market has been weakened by synthetics and artificial fiber.